Home/Commentary/Cool as a cucumber…well almost! Cool as a cucumber…well almost! Thermal image, holding the Graphene Lighting light bulb. One of the things we’ve been concerned about at Graphene Lighting is that the bulbs never get too hot. We don’t want you burning your little mitts! So we’ve had our hands on a T660 thermal camera from FLIR. The kit is great and we’ve had a lot of fun with it—read we’ve been taking lots of thermal selfies!—but we’ve also got some great pictures of the Graphene Lighting bulbs in action. This first one is a nice image which captures the different in temperature between compact fluorescent bulbs and our Graphene Light bulb, you can see how much more energy is turned into heat than light meaning it’s much more wasteful. This one shows you the bulb lit up next to one of our engineer’s hands. You can see the bulb is only a little above body temperature! 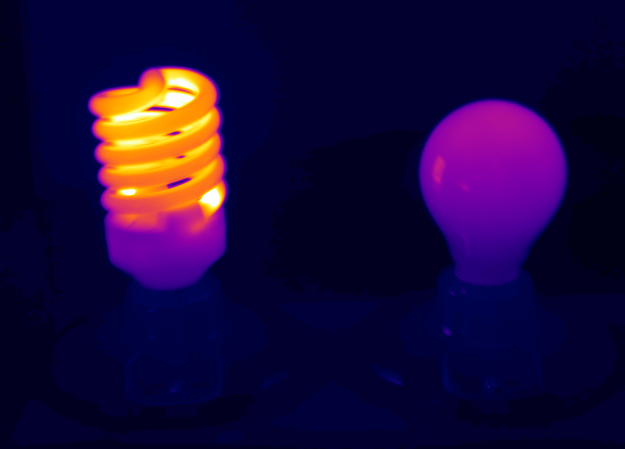 Thermal images of the Graphene Lighting bulb and a CFL light bulb. Exhibiting to the President of China! Copyright 2015-16 Graphene Lighting PLC. All rights reserved.